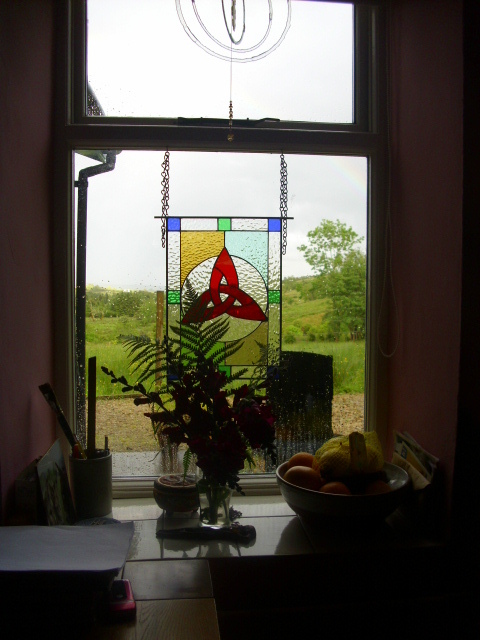 Rainbows and other musings from Prospect Cottage. Are’nt rainbows beautiful? This was one of several which adorned the valley yesterday evening. 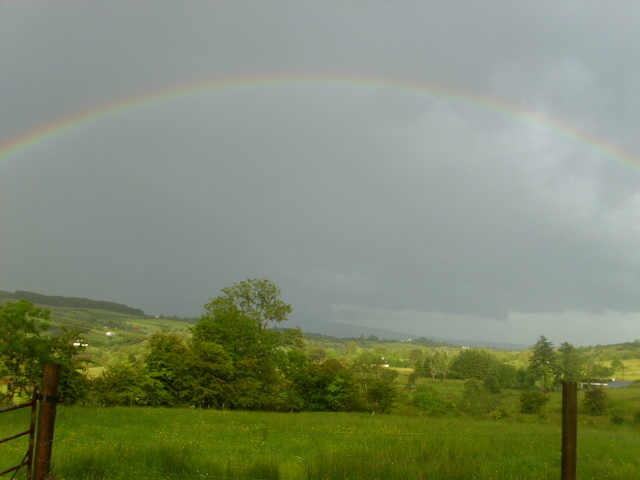 One benefit of the changeability of the current weather, rain and sunshine alternating produce these beautiful arches of prismatic colours in the sky. A vase of Ferns and Snapdragons adorn the window in the fading evening light. The stained glass Trinity Knot has the same colours as the rainbow. The morning sun catches it here in the east facing window and throws it’s own rainbow on the kitchen table. 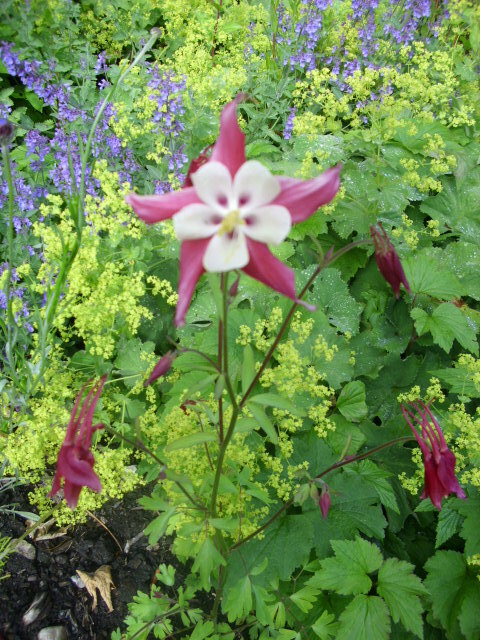 In the new flower bed this Aquilega has come into flower. Isn’t it pretty? I wonder if seeds from this will breed true. I will save some anyway and see what I get. 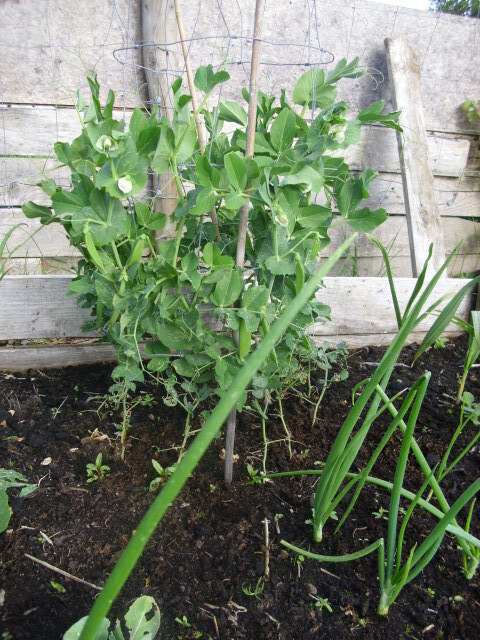 In the veg garden the Peas are flowering and the first pods have formed. These are Meteor a low growing variety. They are supported by a circle of sheep wire held in position with a couple of bits of bamboo. 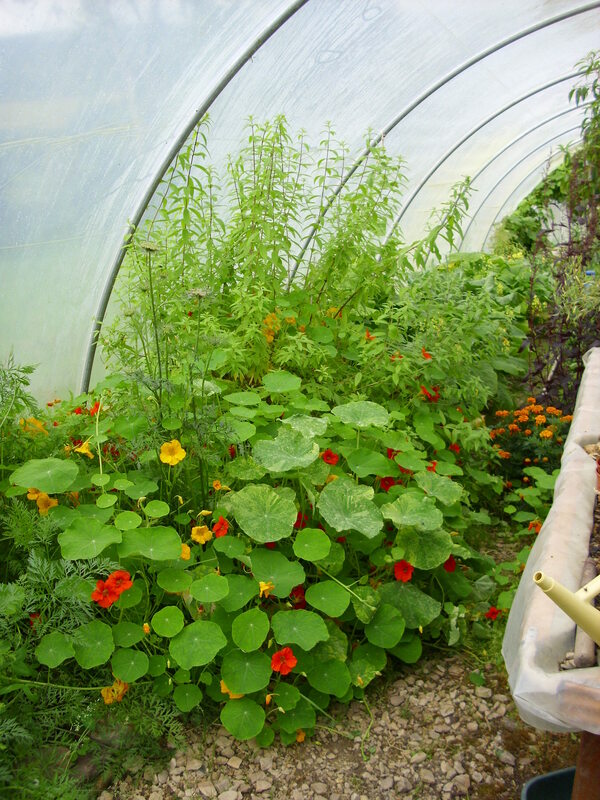 Lots of edible flowers have self-seeded in the polytunnel. 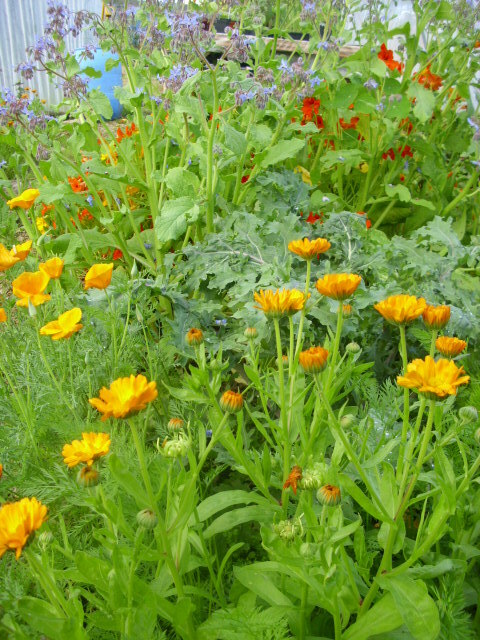 Marigold, Borage and Nasturtiums all add colour to our salad bowls,Kale and Carrots are growing in this patch too. This system of companion planting keeps everything healthy and disease free. At the opposite end of the polytunnel Cosmos and Borage are also attracting lots of beneficial insects. Companion planting @ Prospect Cottage. 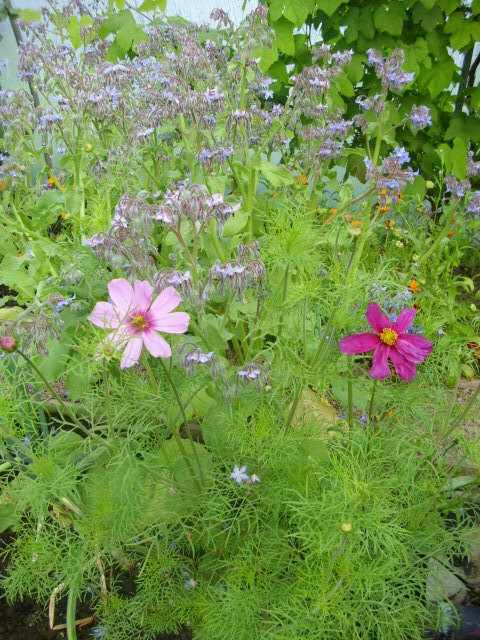 Companion planting is the planting of mutually benificial plants in close proximity to each other with the result of deterring pests or attracting predators for any pests that may occcur. As well as being pleasing to the eye, as opposed to boring pest-inducing monoculture, it brings a more balanced eco-system into your garden. In essence, letting Nature take over. Carrot fly seems to be a big problem in Ireland. 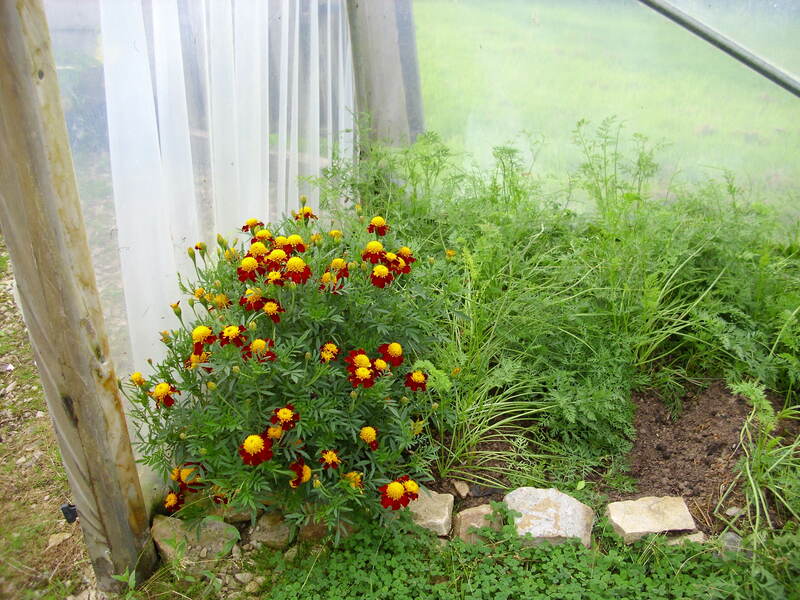 The usual remedy is to put a 3-4 ft high barrier around the carrots, the reason being that the carrot fly does’nt fly higher than 3 ft. A more asthetically pleasing solution is to plant French Marigolds amongst your Carrots. Marigolds also exude a substance that kills nematodes and deters whitefly. Don’t plant them near Beans as the Beans won’t do well. Nasturtiums planted around fruit trees deter wooly aphids. 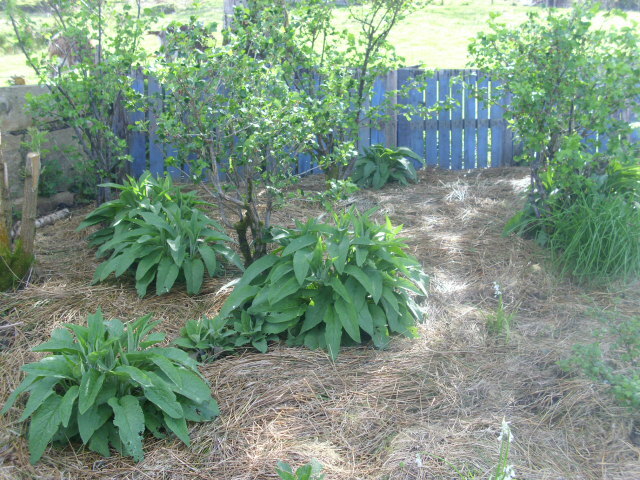 They are said to improve the flavour and vigour of their neighbouring plants. They act as a deterrent for aphids and but also attract hoverflies who love to dine on greenfly. The also have the added bonuses of being attractive and edible. The leaves give a spiciness to salads and the flowers look amazing when strewn on top. Once you have them you’ll never have to plant again as they self-seed profusely. The seeds can also be pickled as a substitute for capers. I can’t vouch for this as I have’nt tried it myself. Rhubarb is a good companion plant for all brassicas. A spray can be made from it’s leaves, they contain oxalic acid, to control blackspot on roses and as an aphid deterrent.